Out Of Ireland small red, brown and black check shirt that gives a modern and casual look. Regular fit. 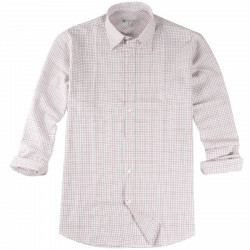 Small light red, brown and black check shirt. Point buttoned collar, tone on tone. Double buttoned sleeves. Long sleeves.